Through the centuries, human beings have tried to establish their dominance over animals, killing them for both food and sport. Even today, animals continue to be exploited in the name of scientific research. FORMER environment minister Maneka Gandhi's exhortations against cruelty to animals were often extreme -- depriving itinerant animal trainers of their pets or campaigning against the killing of stray dogs even though this could expose children to rabies. Now, Richard D Ryder, former programme organiser for the International Fund for Animal Welfare, says after studying human-animal relationships through the ages, that environmentalism is rooted in the desire to preserve natural resources for human beings and arises from "speciesism", as does cruelty to animals and denying them the right to live. Speciesism -- which entered the Oxford English dictionary recently -- is Ryder's term for discrimination on the basis of species and it is associated in history with justification of wanton cruelty to animals. The powerful seek to rationalise exploitation of the weak by minimising and even denying the weak's capacity for suffering. Just as slavery and colonisation were justified on racial grounds by those practising it, tactics ranging from pragmatic argument to more subtle psychological deception have been used to defend speciesism. Even now, for instance, many Western cultures exaggerate their need for meat. And, scientists have exaggerated especially in the last century the importance of animals in research. As early as the Stone Age, cave-paintings featured animals -- an indication of the extent to which human beings were preoccupied with them. 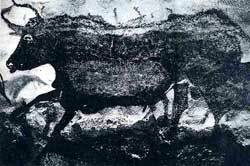 The frequent imagery of bulls in the Paleolithic cave-paintings of Spain and Neolithic cave-paintings in West Asia suggest worship of a bull deity, a practice that prevailed in Crete and Egypt. The crowning myth of Mithraism and a symbol of humans conquering beasts was the killing of the bull by the divine Mithra, portrayed as an idealised human figure. The killing of the bull -- a possible origin for modern bull-fighting -- is an early example of associating speciesism with manliness. The Egyptians, too, were intensely preoccupied with sacred animal forms. Between 664 BC and 332 BC, the manifestation of gods in individual animals -- for example, the sacred bulls of Apis, Minevis and Buchis -- was extended until every animal that manifested divine powers was sanctified and accorded ritual burials. To kill a cat was a capital offence in Egypt around 1500 BC, though the Greek historian Herodotus reported later that the killing of any wild animal was punishable by death. Such strict laws favouring animals have never been enacted since and it was not until the 19th century that England passed its first laws barring cruelty to animals. The Greeks esteemed dogs highly and Pythagoras, the great mathematician who lived around 530 BC, contended both animals and humans have souls. Ryder attributes this view of Pythagoras to be an offshoot of the influence of Eastern religions such as Hinduism, Jainism and Buddhism. The Greek philosopher Aristotle (384-322 BC) argued human beings are endowed with the gift of rational thought and so they head a natural hierarchy of animals in which the less rational exist to serve humans. Unfortunately for the animal kingdom, Aristotle's philosophy eclipsed that of Pythagoras in succeeding centuries and was expanded to project that everything in the world was created for the benefit of humankind. This view shaped Western thought for years to come. The Romans were notorious for their cruelty to animals, which were branded with red-hot irons and baited in the arena to provide sport for the masses. But the Romans also produced many humanitarian writers, including Pliny, Virgil, Lucretius and Ovid. Plutarch, the Greek-born philosopher who lived in Rome from AD 46 to AD 120, was a vegetarian and advocated the need for treating both human beings and animals with kindness. Plutarch also contended that much of the cruelty shown to animals stemmed from humankind's uncontrolled passion for meat. Christianity, partly in reaction to the Roman cult of violence, limited its concern to human beings. St Paul, the most influential of early Christians, did not take up the cause of animals. One possible reason why early Christianity did not consider non-human beings more empathically within cardinal Christian principles of love was the need to overcome religions stressing animal worship. St Thomas Aquinas, who was born in Sicily in AD 1225, re-popularised Aristotle's view that humans and animals are unequal. Kindness to animals was ascribed to saints like St Francis of Assisi. But, in the main, many in the Roman Catholic Church continued to follow the Aquinas line and even as late as the 19th century, Pope Pius IX rejected the formation of a society in Rome to protect animals, contending that human beings had no duty towards lower creations. The Middle Ages were no exception to the age-old ambivalence in the human-animal relationship. Animals were given a place in the community and legal proceedings could be conducted against them (See box), but the equally elemental, sadistic desire to dominate animals was displayed in the form of various baiting contests. Throughout the Middle Ages, as in classical times, hunting and slaying wild beasts was extolled as a sport in Europe. Ryder says hunting satisfies a basic instinct in humans, which leads to deplorable activities, such as bullying, and is rooted in the formerly essential tasks of food-gathering and defending against predators. These were the tasks allotted to the strongest and bravest and long after hunting has ceased to be essential for human survival, humans indulged in these tasks for pleasure and to establish dominance. But towards the end of Elizabeth I's reign, Londoners, for example, began showing a preference for more intellectual pursuits, such as the theatre and in 1567, Pope Pius prohibited bull-fighting and the baiting of wild animals and denied a Christian burial to bull-fighters killed in the ring. Though blood sports seemed to be on the decline, there was a rapid increase by the end of the 17th century in the practice of vivisection. Scientists such as Robert Boyle (1627-91) and Robert Hooke (1635-1703) in England were avid vivisectionists. They, however, seem to have been aware of the pain they caused, unlike mathematician-philosopher Rene Descartes (1596-1650), who maintained that as animals did not possess consciousness, they therefore did not feel pain. AMIT MITRA wrote this based on Animal Revolution -- Changing Attitudes Towards Speciesism by Richard D Ryder, published by Basil Blackwell, UK.